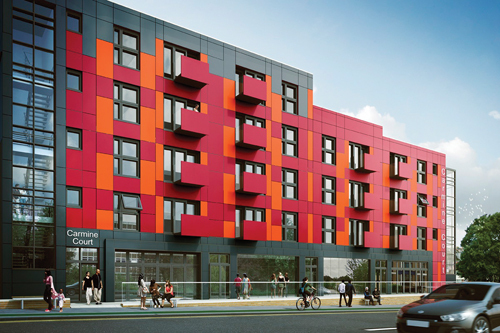 Interphone has installed an integrated access control and fob entry system at Carmine Court, a new apartment building in Rayners Lane, Harrow. The solution included features such as restricted lift access and resulted in a subsequent request for an IP CCTV system. Interphone was appointed following difficulties with a previous supplier. The company completed the implementation of the bespoke security solution, including the installation of all entrance panels, fob readers and monitors across the 31-apartment block, within a week of receiving the order due to the urgency of the work. The lift access only allows fourth floor residents to travel to their level by scanning their key fob on entering the elevator. Interphone had to work with the lift manufacturer to install the system and ensure all equipment operated effectively together. This required an onsite meeting where engineers from both companies teamed up to integrate the technology and enable the required key fob activation. Interphone was then asked to submit a proposal for an IP CCTV solution, which was not part of the original brief. This additional requirement, made up of 33 cameras, covers the car park, perimeter of the building and common internal areas, providing the managing agent with recorded footage of all areas of the development. The CCTV has already proved to be of use following a theft that occurred in one of building hallways. The incident was captured on camera, so a high-quality recording was able to be viewed by the police to help with their investigation.